Many of the things that helped STS stand out this year were culture-focused. 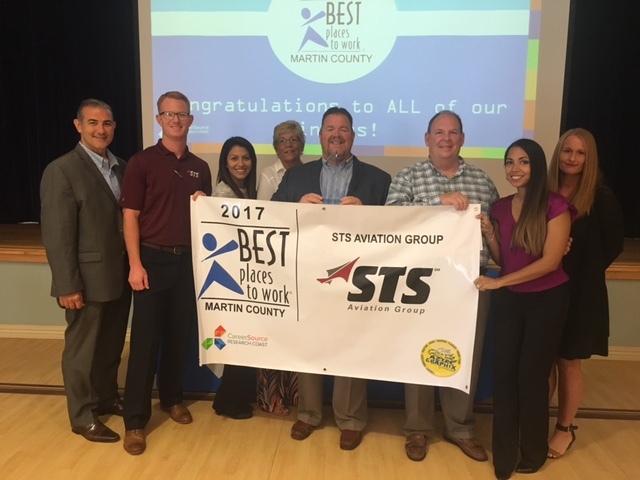 For example, the Martin County Business Development Board recognized STS Aviation Group’s casual, fun and friendly workplace atmosphere. The board also highlighted STS’ employee involvement in community outreach efforts. Additional items of distinction were mentioned by the board and include STS Aviation Group’s comprehensive employee training program, the generous amount of paid time off the company grants as well as its highly-competitive benefits packages given to every full-time employee. STS Aviation Group takes this honor very seriously, and the company cannot thank its staff enough for their daily contributions, enthusiasm and drive. Without the best employees in Martin County, STS Aviation Group would be just another company.